Smaller in Time: Introducing FITTYSENSE! You guys name your things right? Like, my garbage disposal's name is Harold. Harold loves it when we have leftovers after dinner that we're not going to save. nom nom nom. Anyway, I'm so so so very excited to announce that I decided to take the plunge and purchase my very own FITBIT!!!! My dear blogger friend Kelly is a fitbit ambassador and recently had a giveaway...I made up my mind right then and there that if I didn't win, I was going to buy one, because she loves hers to pieces and is always gushing about how amazing it. If you're on the fence about getting one, scoot on over to Kelly's Blog and run a search on fitbit, you'll find all of the delightful things she says. So, what is a fitbit? It's basically like a glorified pedometer, the new model gives you not only steps taken each day but also determines how many flights of stairs you've done (how cool is that?) They recently introduced the "plum" model (on the right), so that's what I went for. 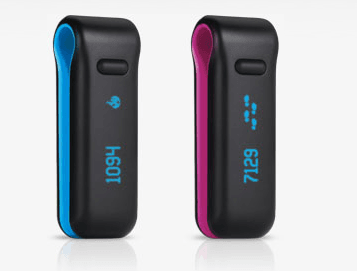 You simply clip your fitbit somewhere (pocket, bra, belt, etc) and FORGET about it! You won't even know it's there, and neither will anyone else (depending upon where you put it). When you dock it or come within 10 feet of your fitbit dock, it will automatically sync with your dashboard. I have set my dashboard up and shared it with all of you, check it out with my new link up at the top of my blog!! You can also use it to monitor your sleep, I haven't done this yet because my Fittysense just got dropped off by the mailman approximately 5 hours ago. How Fittysense was born. Strangely enough, I was talking to my sister Colleen a few days ago and I told her how excited I was that I had just bought a fitbit. She replied "weird, I just got one too." Not unlike twins to do creepy things like that though. Anyway, once she got her's she declared his name to be "Fitty". I thought it was cute, but it reminded me of "fifty", and then all I could think about was "50 cents"....so anyway, I quickly decided that my new addition was going to be called Fittysense. Haha get it? 50 cents? Fittysense! I changed it a little. Anyway, I'm really excited about this little guy, but a bit depressed because my sister is KILLING me on the daily steps. 2) I have mono and therefore walk NOWHERE. I barely leave my house!! I hope to be able to pick up the activity level soon so she doesn't continue to put me to shame. Do you have a fitbit? Want to be my fitbit friend? Search for me via my email address (smallerintime at gmail dot com). I just got one too!! Love it. I just sent you an invite. I should clarify, Fitty's full name is Fitty Shades of Plum. And furthermore, even when your mono is cleared up, I plan on still killing you with my steps. Sorry. I keep hearing good things about them. Have fun with it. I will be interested to see how you like it. Actually that sounds really awful. Pedometer buddies sounds less...err.....freaky! Let me know what they're like. So glad you fixed that. I think my jaw dropped when I saw "pedo buddies"...I will not be your pedo buddy! I have one and like it but I am home most days so I really only wear it when I go outside. It's encouraging to see how far you've walked. I think the most steps I've ever taken is 25,000 in one day. I also like the it tracks steps. I hope you get well soon.